Small and compact. Some would say its a travel size. Others would call it a mixing size. No matter how you look at it, this is a great size to give your new favorite tobacco a try. 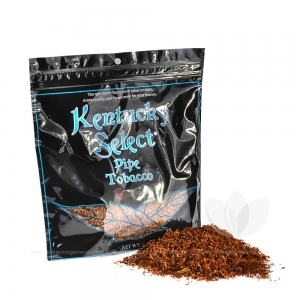 The Kentucky Select Blue is similar to the Green Menthol, but features a more medium-bodied tobacco mix with a softer aftertaste. Fair warning, this is in every way, shape and form still a menthol blend, so if you're not a fan but still want something easier, then Natural Gold might be a better choice. Each bag is created using a unique processing method to bring out the all natural flavors of the tobaccos and deliver an uncompromised smoke.